This request came from a customer who liked the idea of an anniversary journal where you write in it every year on your anniversary. However, he wanted he and his wife to write in it a lot more than once a year. He wanted to fill one page a week for sixty years. 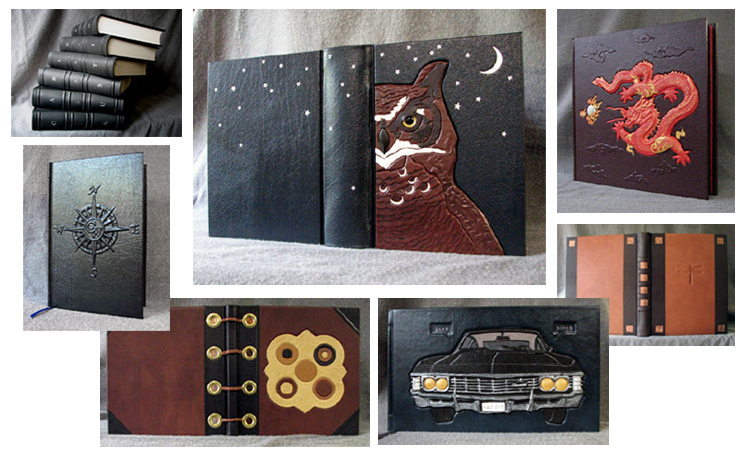 This project morphed into a multi-volume set with a total of 1,500 pages. 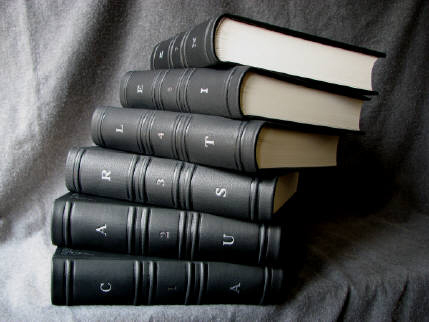 When the books are lined up on the shelf, the couple's names can be read across the spine (Carlee and Austin). 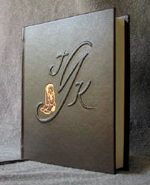 The volume number of each book is stamped in pewter foil on the spine in the center. She said "yes" when he presented these to her as part of his proposal. 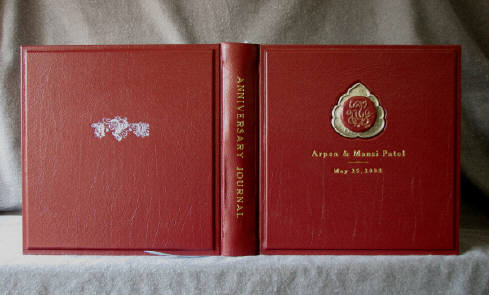 This anniversary journal is one that the couple will write in every year on their anniversary. They wanted to incorporate the monogram and cowboy boots used on their wedding invitations. 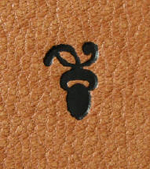 The monogram was carved from the underlying cover board. 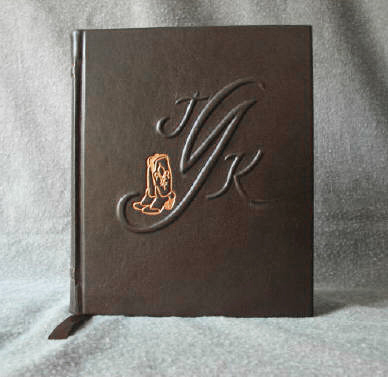 The cowboy boots were added using a custom metal die and copper stamping foil. My customer sent me the couple's wedding vow so that I could print them out and add them as the first printed title page of the book. 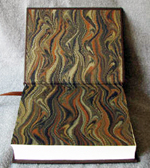 The marbled endpapers are a swirl of fall colors in brown and rust and gold. This book is a very straightforward and classic leather binding, but my customer's choice of colors made it particularly striking. 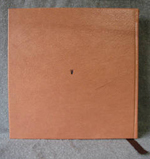 This was a particularly beautiful piece of soft tan goatskin leather and I was happy that my customer really wanted to let the leather shine as the main feature of this book. You never know exactly what color you will get when you order "British tan" leather...it can vary from this to a much more orange-tan. 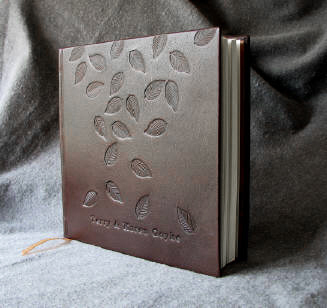 This book was created to serve as the guest book at a couple's 25th wedding anniversary party. The dancing couple on the front was inspired by the 1950's era illustration of a dancing couple on the party invitations. 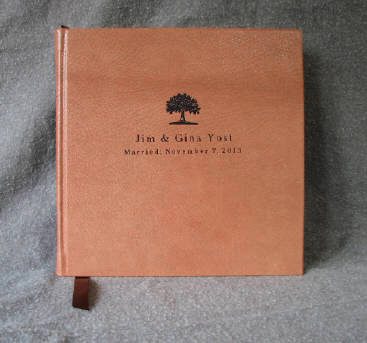 This couple wanted their guests to write and draw on the pages, so the pages are rather large. 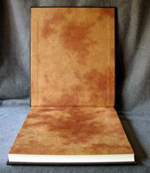 The mottled endpapers compliment the shades of copper used on the cover. Created to reflect the colors used in their traditional Indian wedding, this anniversary journal was ordered by a husband for his wife. The cover features an antique cast metal decoration and a raised medallion with the image of deity Ganesh done in the style of calligraphy and accented in gold pigment. 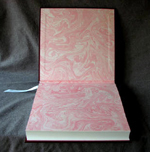 The pink marbled endpaper (made by me because it was hard to find any pink marbled paper) and pale blue accents are all part of the wedding colors. 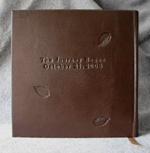 Created for a couple who wanted an anniversary journal with a fall theme to fit their fall wedding date, the front cover features randomly-falling leaves with a few "blowing" over into the back cover. 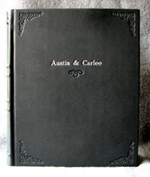 All lettering and decoration on the book is blind stamped (pressed into the leather with heat and pressure but without a foil color) which gives the book a lovely, subtle quality.